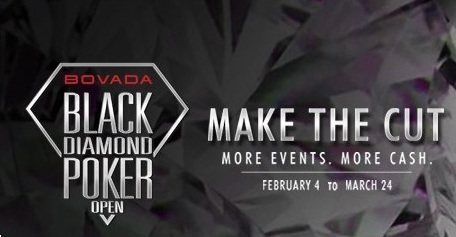 Great news for online poker players, the Black Diamond Poker Open is back on both Bodog.ca and Bovada.lv between February 4 to March 24. The second annual poker tournament series on the Bodog Poker Network called Black Diamond Poker Open 2 or BDPO2 for short will the following poker tournaments with over 2,000 satellite tournaments. Bovada and Bodog are offering a new deposit bonus to kick start the BDPO2. Between February 4 to March 24 the new deposit bonus is 200% up to $1,000.